I met Liz when we did a Christmas market together but I’d already been following her on Instagram and had my eye on a couple designs that I wanted to stock for Spring. 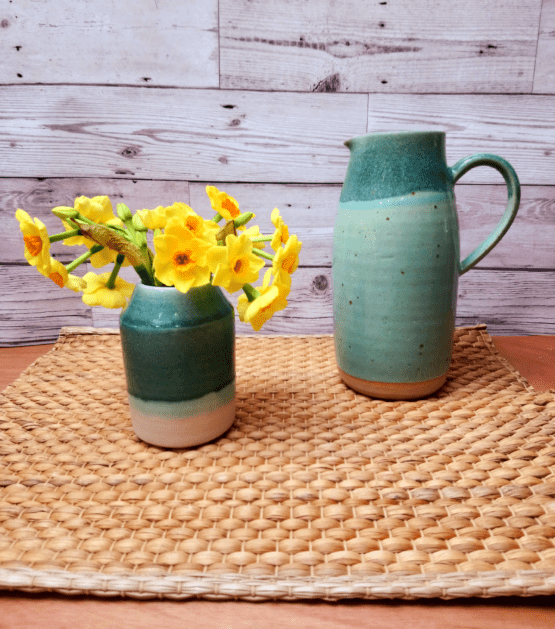 These shades of green are my favourite colours and these water jugs are a beautiful shape. They are great for serving drinks or you could fill with big blooms and use as a vase too. Each piece is thrown on the pottery wheel in her lovely field-based studio in Bristol using a blend of clays and glazed in 3 stages to achieve the layered result. She applies a matte grey over her turquoise glaze to create this beautiful green, totally unique in each firing depending on the thickness and position in the kiln. Liz’s forms are made to be very tactile, with gentle curves to fit your hands. Everything is fired to 1260c, making it more durable and dishwasher / microwave proof. If not in stock, these jugs can be made to order within 3 weeks. Dimensions: H21cm x Diameter 6.5cm. Liz is a lovely Bristol-based ceramicist who teaches pottery workshops for both kids and adults from her studio and creates unique one-off pieces, using stoneware or porcelain. When I saw one of her designs in these shades of green on her Instagram, I fell in love with the colourways and when we met soon after at a Christmas market, I asked if I could stock some pieces in these colours so she created a small collection for These Two Hands. She is inspired by the thought of her pots becoming a part of someone’s daily ritual, whether as their favourite bowl for breakfast or first choice of mug for their morning coffee. After graduating from Manchester School of Art, Liz undertook a 1 year Apprenticeship at North Street Potters in London before joining their collective. There she became involved in making a range of tableware for restaurants including Coya in Mayfair and Fera at Claridges. She now produces a mix of work for use at home and in restaurants, both hand-built and on the wheel. Each piece goes through a mindful process to achieve the final creation. First she prepares the clay by wedging it to remove air bubbles so it becomes the perfect consistency to use. She weighs the clay according to what she’s making and hand-moulds it into balls for throwing on the wheel or rolls it out into flat slabs for hand-building. Once the pieces are thrown or constructed they are left overnight to firm up before turning or trimming to neaten the bases. A few days later, once bone dry, work is stacked inside the kiln for the bisque firing to 1000c. After 24 hours the kiln is cool enough to open and designs are decorated or dipped in her unique glazes. Once all glaze has been removed from the bases and foot rings, she signs the piece and they are carefully placed back in the kiln for their second firing to 1280c. Around 36 hours later, if patience allows, the kiln is opened when down to below 100c and everything is laid out on a table to cool. Then the final stage is a quick sand of the base to remove any roughness and they are ready to use.